We can provide and operate sound equipment for events of all sizes. Speakers can be set up with either speaker stands or dedicated scaffolding towers. We can provide music, microphones, and a hook up for an iPod or portable music player if requested. 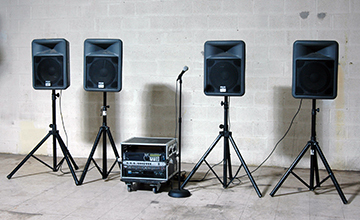 Our sound systems typically range from 2 to 8 speakers per system while larger sound setups are available upon request.